It might be Fox News’ worst nightmare: liberal bloggers and black hip hop. The Fox News Channel has faced criticism that it is biased against Sen. Obama… including one anchor’s suggestion that a fist-bump between Barack and Michelle Obama could be a "terrorist fist-jab"…. Fox News is owned by News Corp., which also owns Dow Jones, publisher of The Wall Street Journal. 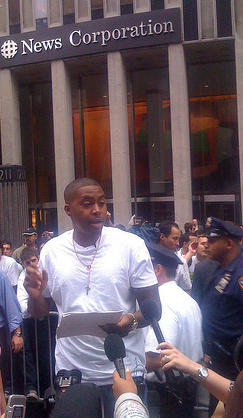 On Wednesday, a group of protesters from the organizations ColorofChange.org and MoveOn.org, led by the hip hop artist Nas, will deliver a petition with more than 600,000 signatures to Fox, urging the network to "end its pattern of racist attacks." A Fox News spokeswoman declined to comment. The latest smear from Move On is telling their Kool-Aid-drinking zombie followers that Fox News is smearing Barack Obama and is a racist concern. Of course, that’s a lie. This broadcast and FNC in general have been exceedingly fair to Senator Obama. … But in order to intimidate anyone from criticizing Obama in any way, Move On is playing the race card. Michael Connery posts the Colbert segments here.